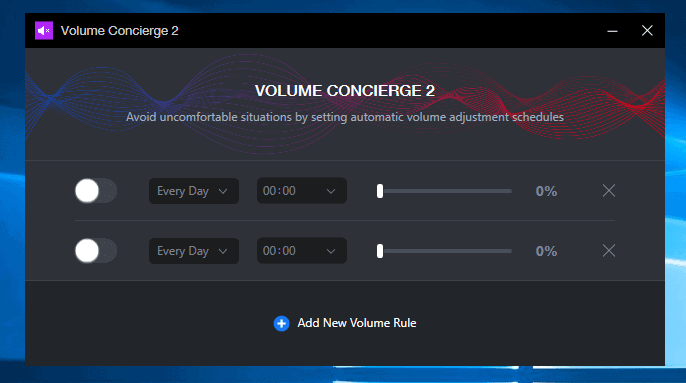 Volume Concierge 2 is a free program for Microsoft Windows PCs that lets you configure automatic rules that change the system volume. You can change the volume for individual applications on Windows, but you cannot make any other modifications to it. Maybe, you'd like the volume to be lower in the morning or late at night, and higher throughout the day. Or, you want the volume to be high on the weekend when you play all that rock music on your PC, or very low late at night when you listen to an audiobook before you fall asleep. We reviewed the first release of Volume Concierge in 2011. Warning: Volume Concierge is free software. It includes a PUP (potentially unwanted program) offer in the installer though. The offer to participate in "The Savers Fund Charity Network" is enabled by default. You need to uncheck the button and click on "skip and ignore saving others" to block the participation. Volume Concierge 2 displays a single volume rule when you launch it by default. You can click on the "add new volume rule" button to set up additional rules. Rules define day, time and the volume level. Days are limited to every day, work days or weekends. While that works well for many use cases, an option to select specific days of the week would improve the program further in my opinion. The time is limited to the start time. If you want to define start and end times, you need to configure two rules to do so. Volume Concierge 2 runs in the background from that moment on. The program is started automatically on system boot by default. If you have disabled the option in the setup, you may add it again with a right-click on the program's system tray icon. Volume Concierge is not the first program that gives you more control over the volume of your Windows PC. Speaker Locker (previously known as Speaker Admin) can change the volume automatically based on the time of the day. It restricts the volume to a certain range, e.g. exactly 50 or greater than 75, and locks the volume at that level. Volume² is a free program for Windows that supports a wide range of features. You can schedule the volume changing and make use of nice to have features such as keyboard shortcuts, mouse events, screen edge volume controls or an on-screen display. Volume Concierge 2 is a specialized program to change the volume of the system automatically based on day and time. It may be useful to you if you need the volume to be at a certain level at specific times of the day; most users probably don't require it. The program uses about 20 Megabytes of memory while it runs in the background. Note that its download or installation may be blocked by your antivirus solution because of the inclusion of the third-party offer. Now You: Do you use small helper apps like Volume Concierge 2? Sorry for stealing the agenda, but this sounds important. lol what a stupid advertisment for that fail book with fail research. Of course! Better read the history of Tor. My gosh . . . the entire project was invented by the U.S. Government. Martin, about half the time I come to ghacks (every day, without fail! ), the normal interface is there, iow the posts have their graphic on the left. The other half of the time, the graphic isn’t there, just the text, which is much less appealing. For example, today, the graphics are there, yesterday they weren’t. Just wondering – any reason for that? This looks like a handy program. But I am not convinced that it offers more functionality than the program who Martin Brinkmann from the excellent website Ghacks.net (:-) reported about on October 16, 2013, which is called SoundVolumeView, with whom can also create multiple sound profiles and switch between them at will. This utility works on Windows Vista, Windows 7, Windows 8, Windows 2008, and Windows 10. Both 32-bit and 64-bit systems are supported. Windows XP and older systems are not supported. I can’t be without 3RVX 2.5. I have it set to increase or decrease volume with ctrl+shift and mouse wheel. Agree. I had dedicated keys on my old keyboard for volume, but not the new one. 3RVX to the rescue. I use ctrl and alt and up/down arrows. Works on any screen. I’ve looked hi and lo all over the web for a GUI replacement for the built-in mixer in windows7. Why? I absolutely hate the large size of the thing and the fact that I have to scroll left or right to get to some of the applications controls. Does anyone know of a GUI replacement that is small and unobtrusive and replaces that awful large abomination? You know, something like maybe the old windows2000 or XP sizes. Is there a way to set all my sound from PC to be at same level? I still hope for a simple program with a smart gui that lets me drag and drop audio sources (applications) onto output devices in whatever combination I want. Handy for switching between speakers and headset. mostly I start with sound on speakers, but when Someone else comes online you can’t switch ll sounds to the headset without closing the app, change windows default sound system and starting the app again.